Fresco is a platform for crowdsourced news that also includes an assignment dispatch system for newsrooms to request specific materials. Screenshot courtesy of RJI. This week we learn how a new technology uses predictions to speed mobile video playback; and we explore another platform for crowdsourcing photos and video. A technology from Inmobly can predict which videos a mobile viewer might want to watch and download files in advance as a way to avoid delays during peak network traffic times. Co-founder and Chief Executive Officer Hesham El Gamal tells us how it works. New York-based Fresco is building a consumer-facing platform for crowdsourced news that also includes an assignment dispatch system for newsrooms to request specific materials. 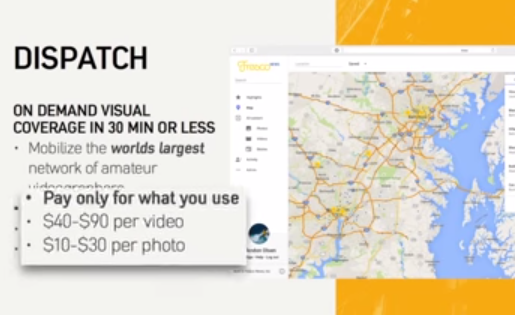 Chief Executive Officer John Meyer says the app could help journalists get visual content from the scene in a fast, direct manner. Reuben Stern is the deputy director of the Futures Lab at the Reynolds Journalism Institute and host and co-producer of the weekly Futures Lab video update. The Reynolds Journalism Institute’s Futures Lab video update features a roundup of fresh ideas, techniques and developments to help spark innovation and change in newsrooms across all media platforms. Visit the RJI website for the full archive of Futures Lab videos, or download the iPad appto watch the show wherever you go. You can also sign up to receive email notification of each new episode.